When an animal, insect, bird, or other creature from nature appears repetitively, whether in real life or dreams, it is time to pay attention and find the message that nature is bringing you. 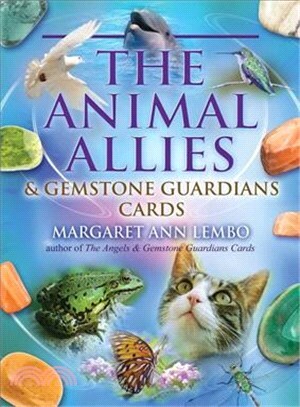 This deck of 44 oracle cards by Margaret Ann Lembo pairs 44 gemstones with the teachings of their vibrationally matching animal allies to provide guidance and messages of hope, happiness, and well-being. Animal allies are helpers, supporters, and your spiritual entourage, here to reveal self-knowledge and provide clarity on life’s challenges. The Gemstone Guardians are the devic force of the gemstone, which adds energetic assistance in achieving goals and desires through the color and geometric structure of the stone. Each of the cards in this deck offers a question for contemplative thought, a positive affirmation, and Divine Guidance. Add these cards to angel communication sessions and tarot card readings for added insight and direction. Pull a card a day for inspiration and use the affirmation throughout your day. Follow the Divine Guidance and repeat the affirmations from animals to transform your reality into joy, wealth, health, protection, and happy relationships. Margaret Ann Lembo is a noted author and speaker, sought after for close to 30 years. The author of The Essential Guide to Crystals, Minerals, and Stones and Color Your Life with Crystals, she is a spiritual entrepreneur and practitioner, aromatherapist, and the owner of The Crystal Garden, a bookstore, gift store, and spiritual center in southeast Florida. Richard Crookes has more than 30 years’ experience as a freelance artist, illustrator, and calligrapher. He has worked on the award-winning Angels of Atlantis Oracle Cards, Astrology Reading Cards, and, with Margaret, The Angels & Gemstone Guardians Cards, The Archangels & Gemstone Guardians Cards, and Masters, Mystics, Saints & Gemstone Guardians Cards. He lives in Bangkok, Thailand.